A school which was told it unlawfully excluded a Muslim pupil for wearing a traditional gown has won its appeal at the House of Lords. 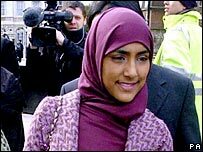 The Court of Appeal had said Denbigh High School had denied Shabina Begum the right to manifest her religion in refusing to allow her to wear a jilbab. But in a unanimous ruling, judges at the House of Lords overturned that. They said the Luton school had "taken immense pains to devise a uniform policy which respected Muslim beliefs". It had done so "in an inclusive, unthreatening and uncompetitive way". They said: "The rules laid down were as far from being mindless as uniform rules could ever be." They added: "It appeared the rules were acceptable to mainstream Muslim opinion." Shabina Begum had chosen a school which "went to unusual lengths to inform parents of its uniform policy." They ruled there was no interference with her right to manifest her religion as she had chosen a school where such a policy existed. There were three other schools in the area which permitted the jilbab, they noted, although one was oversubscribed. Miss Begum eventually attended another local school where she wore the jilbab. Lord Bingham ruled that the two-year interruption of her schooling was the result of her "unwillingness to comply with a rule to which the school was entitled to adhere". After the ruling, Miss Begum said: "Obviously I am saddened and disappointed about this, but I am quite glad it is all over and I can move on now. "I had to make a stand about this. Many women will not speak up about what they actually want. "I still don't see why I was told to go home from school when I was just practising my religion. "I'm just a teenager - not many teenagers go out there and challenge the system." She said the shalwar kameez (trousers and tunic) which Denbigh High School allows Muslim pupils to wear, "did not satisfy Islamic clothing". "I feel it is an obligation upon Muslim women to wear this [the jilbab], although there are many other opinions." She would consult her lawyers about a potential appeal to the European courts, she said. In March last year, Denbigh High School said it had "lost on a technicality" when the Court of Appeal said it had failed to consider the Human Rights Act implications of its school uniform policy. The school, where 79% of the pupils are Muslims, said it had reached its policy after consulting the Department for Education and Skills, leading Muslim groups, parents and pupils. Lord Justice Brooke had called for more guidance for schools on complying with the Human Rights Act. A DfES spokesman said he welcomed the ruling, which confirmed current school uniform policy was lawful. "What an individual pupil should or should not wear in school is a matter for individual schools in consultation with parents."